Perhaps our most famous and widely acclaimed training programme, the GUE Fundamentals course has literally transformed the skills and confidence of divers across the globe. Whether you're looking to progress on to more advanced training within the GUE system or you're an experienced open circuit diver who simply wants to give your skills and knowledge a shot in the arm, the GUE Fundamentals course will make you a better, safer and more competent diver. The GUE Fundamentals course is designed to cultivate the essential skills required by all sound diving practice. 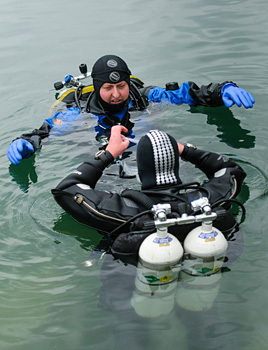 The course focuses on cultivating the basic skills required for all sound diving practice. It is focused on increasing diving fun by reducing stress and increasing diver proficiency through proper control of buoyancy, trim, propulsion, teamwork and other GUE principles. 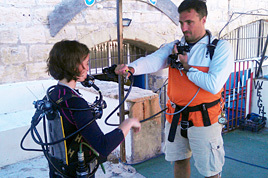 Included among its course outcomes are: providing the recreational diver, who does not desire further diver training, with an opportunity to advance his/her basic diving skills; training divers in the theory and practice of Nitrox; providing divers with aspirations for more advanced diver training with the tools that will contribute to a greater likelihood of success; and providing non-GUE trained divers with a gateway into GUE training. As well as providing a gateway to continue your education within GUE, successful completion of the GUE Fundamentals course also qualifies the diver to use Nitrox 32% for minimum deco dives in the 0-30m range.